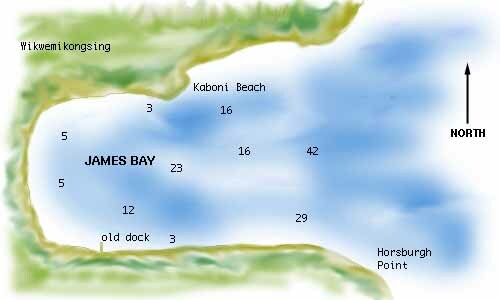 James Bay is located along the eastern shore of Manitoulin Island, about midway in the north-south span of that coast. The harbor offers shelter from winds and waves as long as there is a westerly component to them. For easterly winds is is completely open and should probably be avoided. The bay is about a mile wide, so it is definitely not a "cozy" anchorage. There are no hazards to entering it, but because it is so open, you will have to approach quite close to the shore to find a lee from the wind. The bottom is beautiful sand, gently shallowing and without unexpected shoals, providing excellent holding for your anchor. The water here is extraordinarily clear. On old chart 2286, the village of Wikwemikongsing ("little Wikwemikong") is shown, although it does not makes its presence known from the bayside view of the shoreline. Similarly, the Roman Catholic church spire indicated on that chart is not visible. The shoreline appears to have sandy beach, with the usual heavy woods just behind it. An old dock appears to be in use along the southern shore, but otherwise James Bay looks much like it did when the first French voyageur paddled his canoe into it in the 1600's. 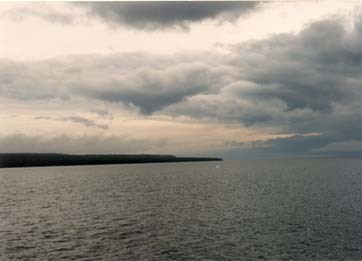 Looking NE from James Bay along Manitoulin's east coast. We have sailed past James Bay--as most sailors do--a number of times, but on one August afternoon with a strong SW wind blowing up, it became a handy refuge for a tired family of sailors. Copyright © 1997, 1998, 1999 by James W. Hebert. All rights reserved.